You are here: Home » New to long-distance walking? Your first long-distance walk may seem a daunting idea, but you don’t need to be extremely fit, nor do you need to spend a fortune on special gear. With sensible planning and preparation, and some basic equipment, you can enjoy a rewarding and healthy holiday. Your first two priorities are to buy and break in a decent pair of walking boots well in advance, and to buy or borrow a rucksack. Everything else can be acquired gradually, once you’re ready to have another go. Don’t forget to test everything out on some long day-walks before you set off. quality of the surroundings and the weather. A group will travel at the pace of its slowest member, or a little less. Terrain is crucial: through a peat-bog, or on loose scree or stones, you will walk slowly and tire more quickly. Gradient affects progress, however fit you are, and even walking downhill can be surprisingly tiring. In splendid weather you may enjoy lingering, whereas in lashing rain, on the last stretch towards a hot shower, you may make astonishing progress. Your feet are about to become the most important part of your body. Sore feet can dominate your day, your holiday and your conversation. Don’t be a blister bore, or, worse still, risk dropping out of your holiday. Take care of your feet and your footwear. Your most important purchase is comfortable walking boots. If possible, go to a specialist outdoor/hiking shop and take your time. The main choice is between leather and synthetic fabrics. The latter tend to be lighter, and may need less ‘breaking in’. Tell the sales people what kind of walking you expect to do, and ask their advice. Another choice is how to make the boots waterproof. Some people favour boots with a built-in waterproof, breathable inner layer (usually Goretex), but this adds to the cost and may make your feet feel hotter. The membrane is easily punctured by small stones, making the boots no longer waterproof and difficult to dry. The alternative is to make the leather or fabric waterproof from outside, by use of a suitable wax or spray. Good fit is vital. Go to a shop that allows you to try out boots at home (indoors only) and will exchange them if they prove uncomfortable: check before you buy, and keep the receipt. Take, borrow or buy suitable socks, and remember that your feet will expand when warm, and also when you are carrying heavy loads: a common mistake is to buy boots that are too short. Specialist fitters can fix almost anything else about a boot, but if it is too short, they are helpless. Test downhill walking: many shops have a practice slope for this purpose: if your toes press against the end, the boot is too short. Many people find that a special insole (or footbed) makes a boot feel much more comfortable, so leave room to try this. Also, good walking socks can make a big difference: these may be synthetic or wool, possibly merino wool. 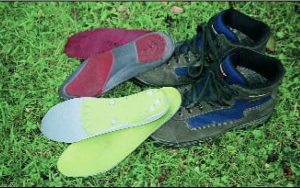 Some people swear by two pairs, a thin liner sock inside a thick outer, whereas others find this leads to friction and perhaps blisters. Always carry a spare pair of socks in your day-sack: if your socks become damp or very dirty, changing them can prevent blisters. However good the boots, only you can ‘break them in’, i.e. let your feet and boots get used to each other. Start by wearing them around the house, then try a half-day walk, maybe up a small hill, and, if all is well, test them out on progressively longer and tougher day hikes. If problems surface, take them back to the shop: better socks and insoles may help, and specialists fitters can adjust the fit. If you are prone to blisters, try rubbing your feet with surgical spirit (rubbing alcohol) daily for a couple of weeks before you set off on holiday, to toughen your skin. (Some chiropodists say that potassium permanganate crystals work even better, but you need to soak your feet in the solution for 10-15 minutes so it isn’t as convenient.) Even if you’ve never had blisters before, there’s always a first time. So carry in your day rucksack a pack of adhesive blister treatment – sold under brand names such as Compeed, Moleskin or Second Skin. Use this amazing stuff as soon as you feel a blister coming on – or even before, to prevent one. Follow the instructions carefully: first ensure that the affected area is dry and clean, then warm the dressing before applying. Remove the backing paper before smoothing it down firmly, so it bonds to sound, clean skin. When the dressing falls off, about a week later, the skin underneath will have recovered: pure magic!. The advice below refers to a day rucksack; if you are camping and carrying your own gear, you need a much larger, heavy-duty rucksack – and experience of carrying heavy loads. In general, pick a rucksack that’s on the generous side: it makes for easier retrieval and packing. 30-35 litres allows for clothing, food and water, but for winter walking consider 40-45 litres to allow for extra clothing, a thermos and perhaps more food. Don’t expect the rucksack to be waterproof: you need either a waterproof cover or liner (e.g. a bin/garbage bag). is large enough for all you need. Modern rucksacks have extra features that you may value, e.g. a special pocket for a water bladder, a built-in waterproof cover, ‘wand’ pockets that allow easy stowage for poles, compression straps, shock-cord lacing to store waterproofs or crampons externally, easy-access pockets on the waist strap, and so forth – the list of features is endless. If you haven’t used trekking poles before, borrow one or two to try. Most people find they help with balance, save effort and reduce knee strain. They are especially useful going downhill and when crossing streams and bogs. Telescopic poles should be set longer for downhill, shorter for uphill. Try before you buy: a pair is more efficient, especially on rough, steep terrain, but some people prefer to keep a hand free for camera, binoculars or dog. However, poles are lightweight, and either or both can be stowed on your rucksack when not needed. To get real benefit from poles, technique is important, and you must use two. Position the poles so that your hands are in front and the poles slope backwards at an angle, with pole tips behind your feet. As you walk, move your arms at the same rate as your feet, alternating your pole plants. Left pole plant coincides with right foot forward (as in this photograph, courtesy of http://walking.about.com), just as your arms swing naturally when walking without poles. Use your upper body strength to push hard on the pole, propelling yourself forward. It feels like having an extra gear! If you walk in winter, note that poles are not suitable for icy or snowy slopes. If you are thinking you maybe need crampons, more likely you need an ice-axe and to practise self-arrest using it. You can gain this life-saving skill from a short course, or perhaps from an experienced friend. You will soon discover other uses for poles: testing the water, digging mud out of boot soles, pushing brambles aside, even self-defence against hostile animals. If you are serious about photography, consider the kind which unscrews at the top to form a camera monopod. The reason for needing special clothing is that your internal temperature varies so much while hiking. This is due to changes in the weather (sun, wind and rain) and in your body’s heat production – rapid on a steep uphill climb, moderate on the level and slow when you pause. To avoid excessive sweating, you may need to shed heat quickly. Next to your skin you need fabrics that ‘wick’ (draw away) moisture. Avoid cotton (especially denim) as it soaks up moisture (e.g. sweat, rainwater) and then you may become chilled. Choose clothing sizes to be loose-fitting, for freedom of movement. Look for flexibility, e.g. trousers whose lower legs unzip to make shorts, and jackets with underarm zips for cooling. To control your body temperature, use a layer system. The base should ideally be a ‘wicking’ fabric, such as knitted polyester or specially treated cotton. In colder climates you may also need a thermal base layer. The middle layer is for warmth, and a fleece is ideal: these vary in weight, the most expensive also being windproof. Your outer layer is a waterproof, windproof jacket and trousers, as ‘breathable’ as possible. This combination will keep you warm and dry even in a downpour and high wind. And if you are lucky with the weather, the outer layers weigh little in your rucksack. Always pack a hat and gloves: never underestimate the changeability of the weather: e.g. you may need a sun hat as well as a warm one. You may also need gaiters: these wrap around your lower leg and boots, protecting them from damp, dirt and snow. Ideally choose gaiters made from a waterproof, breathable fabric such as Goretex. Few novices carry sufficient water, and even fewer keep it handy. You dehydrate quickly when walking, though you may not notice it. Every time you breathe out, you lose moisture, especially when the air is cold and at altitude. Top up your fluid intake as often as you can, and expect to drink one to four litres per day. You should treat water from running streams before drinking it. Purification tablets weigh very little, and equip you for an unlimited safe supply. To counter the flavour, use neutralising tablets or fruit-flavoured powder. Really strenuous walkers may be interested in isotonic drinks, ie water with added minerals to replace what you lose when sweating a lot. Isotonic powder is expensive, but you can make your own: mix 50% fruit juice with 50% water (drinking or treated), then add a pinch of salt and shake. The cheapest container is a screw-top plastic bottle, worth buying because it’s leak-proof. If your rucksack has a convenient outside pocket, this may work fine. Many people prefer a special plastic water bag or bladder, such as a Platypus or Camelbak. The tube threads through your rucksack strap, so you can take a sip hands-free whenever you feel like it. That way, you drink before you get dehydrated. In cold temperatures the tube is prone to freeze. You can buy an expensive insulation sleeve, but it’s cheaper to get in the habit of blowing back after each sip that you drink. By returning the water to the bladder, it’s much less likely to freeze than in the exposed tube. a sleep mat or mattress. Sleeping-bags are filled with insulation of two main kinds: down or synthetic. Their warmth used to be measured by reference to seasons, as in “3 season” (i.e. spring, summer, autumn) or “4-5 season” (meaning winter including snow/ice), but this vague system is giving way to specifying temperatures. Check whether this is measured in Celsius or Fahrenheit (-10 °F is much colder than -10°C; the two scales equate only at -40°). At a given weight, a down bag is warmer than a synthetic but is more expensive to buy. Down does not insulate well if wet, so get a good waterproof stuff-sack. If vehicles or mules are carrying your bags, the extra weight of a synthetic may not matter, but if humans have to carry the load, down is preferable. If you can’t afford to buy a good enough sleeping bag, consider borrowing or hiring one, and buy a liner bag to use inside it. Liner bags may be used for cleanliness or warmth: for keeping the main bag clean, a simple cotton liner works fine and is cheap to buy or make; silk feels luxurious and is lighter. Any liner is easier to wash than the main sleeping-bag. For added warmth, get a micro-fleece thermal liner: it extends the flexibility of the main sleeping-bag by adding warmth only when needed. If your trip covers a wide altitude range, this may be a blessing. Beware of an older sleeping-bag loaned by a kind friend, especially if synthetic. A bag which when new might perform to its rated temperature will lose its ‘loft’ (the ability to trap air, making it bulky and warm) over a period and be colder than you expect. If it is stored in a compression sac, it can deteriorate rapidly and may never recover. Down bags seem to bounce back much better than synthetic ones, but no sleeping-bag should be stored compressed except when on expedition. Sleep mats range from cheap. lightweight foam to thick, self-inflating air mattresses with valves that you blow into to top up the air. Self-inflating mattresses are, naturally, much more expensive and heavier, but they are more comfortable and provide much better insulation. If you are camping at altitude, you need all the warmth you can get. Even if sleeping in huts or refuges, some sort of mat underneath will help to insulate you and improve your chances of a good night’s sleep. Self-inflating mattresses should be stored unrolled and partially inflated. Sign up for our newsletter to keep up-to-date and receive discounts. View the latest newsletter or archive. We send a newsletter every couple of months and you may unsubscribe at any time. We never send emails on behalf of third parties.